The Senate backed the Strengthening America’s Security in the Middle East Act by a lopsided 77-23 on Tuesday, hours before President Trump was to deliver his annual State of the Union speech discussing his policies for the year. Trump is expected to discuss foreign policy in the address to a joint session of Congress, including declaring the Islamic State terrorist group all but defeated. Many members of Congress, including several fellow Republicans, strongly disagree with a plan Trump announced in December to withdraw 2,000 U.S. troops from Syria on the grounds that the terrorist group no longer posed a threat. 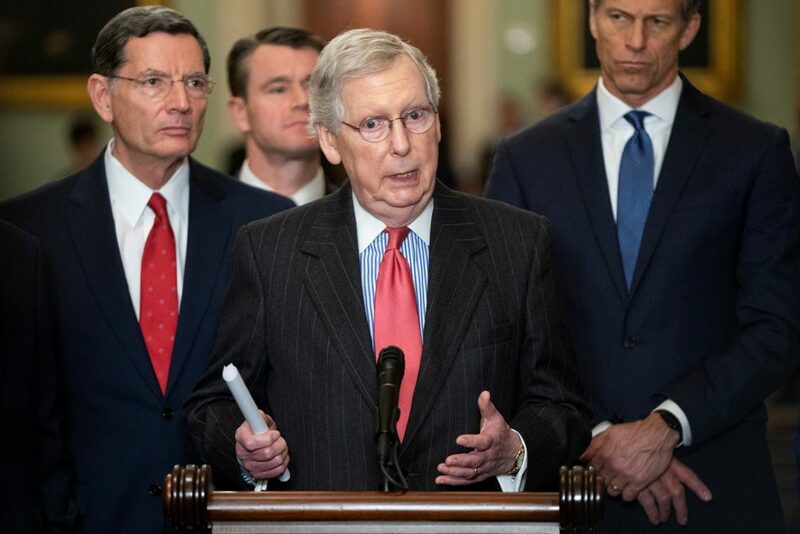 Republican Senate Majority Leader Mitch McConnell, who rarely breaks from President Trump, introduced the non-binding amendment passed on Tuesday. It acknowledged progress against Islamic State and al-Qaida in Syria and Afghanistan but warned that “a precipitous withdrawal” could destabilize the region and create a vacuum that could be filled by Iran or Russia. The bill also includes provisions supported by both Republicans and Democrats to impose new sanctions on Syria and guarantee security assistance to Israel and Jordan. Those are seen as efforts to reassure allies worried about shifts in U.S. policy, including Trump’s Syria plan.